David Russell was born in Los Angeles, California and raised in the Rocky Mountains of Colorado. He completed his B.F.A. in painting at the University of Tulsa in Oklahoma and earned his teaching license in K-12 art education at Metropolitan State College of Denver. Russell completed his M.F.A. in public practice at Otis College of Art and Design in 2011. Russell and Del Hoyo started collaborating in graduate school, which led to the creation of the MobileMuralLab. Roberto Del Hoyo was born and raised in South Los Angeles. He completed his B.F.A. at the California State University of Los Angeles with an emphasis in studio art. In 2010, Del Hoyo earned his M.F.A. in Public Practice at OTIS College of Art and Design. 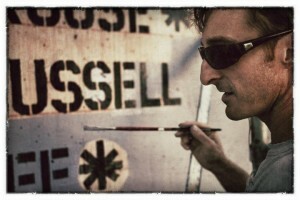 Del Hoyo and Russell’s collaboration was formed on the idea of hybridizing mural painting processes and techniques with an emphasis on social engagement.